This site is all about the card game "Contract Bridge". Included is a freeware game to download, that allows you to get a taste of playing bridge on your PC using the acol bidding system along with many optional conventions. Decide whether you want to use the Stayman, Baron, Swiss, Grand Slam Force (GSF), Blackwood, Gerber conventions. It also contains features that help in learning how to play as well as being able to analyse hands. You can have it display all of the cards, so you can see clearly what's going on. It's possible to manually set the bidding, so you can try out the "What if it had been bid this way" scenarios. During the card play, you have complete control over whether you just play your own hand, or you select to play the cards for both North and South and/or you play the cards for East/West. This means if you didn't agree with the card it chose to play, you can switch to manual at that point, play the card you thought was better and then continue to see how the rest of the hand then plays. 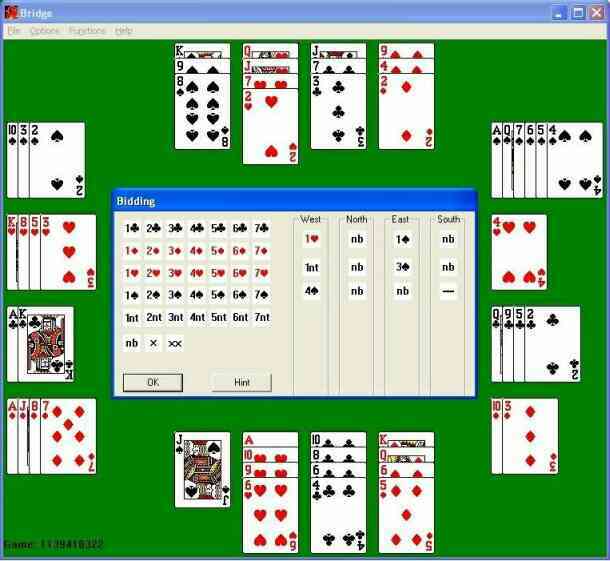 Below is a direct screenshot of the game in training mode, with all of the cards visible. You will find information on everything related to playing bridge, from the basic rules of the game up to complex strategies of both defensive and declarer play. If you want to learn more, why not visit our bookstore. WolfBridge makes use of a lot of the information provided by the bidding when making decisions about which card to play, keeping count of the lengths of suits declared as well as the number of points shown by the bidding. It also makes use of and understand card signals during the play. Along with standard techniques like "Finessing" or "Playing for the drop", when trying to make extra tricks, we hope to make the card player better than previous programs. Bridge is a fascinating game, which gets more and more interesting the more you learn. Hopefully we can encourage lots more people to take the plunge and join in the fun.